Equinox shoppers interested in the V-6 and all-wheel drive could consider the Chevrolet Traverse. It has an identical powertrain, and nearly identical fuel economy figures too. But a new Equinox is on the way for 2018, so stay tuned since the 2017 is scheduled to be a short model year. It has been a sales success for Chevy, so why fix what isn't broken? Answer: they haven't. This year, the 2017 Chevy Equinox carries over largely unchanged from last year. For 2016, the model received important safety equipment and a light "fluff and buff" from the automaker: a front-fascia here, a little chrome there—nothing controversial. The effect is a brighter, slightly better look for the Equinox. The Equinox's selection of engines and drivelines is a copy-paste from last year, which is totally fine by us. 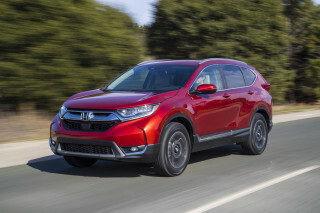 Its base 2.4-liter inline-4 with direct injection boasts a 32 mpg rating from the EPA, making it one of the most fuel efficient compact crossovers money can buy. It and the optional 3.6-liter V-6 are paired to six-speed automatic transmissions. 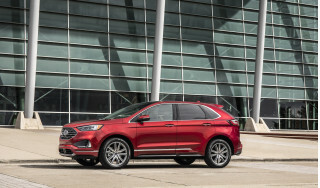 All-wheel drive is available on every trim, except the base L.
To us, the Equinox reads from the outside more like a scaled down version of the big Chevrolet Traverse, which isn't a bad thing. The Equinox is a little chunkier, perhaps with a few more styling elements stolen from Chevy's trucks and wedged into its more upright flanks. The Equinox is still distinctly more car-like than truck, and fits alongside the brand's sedans with good-looking proportions and sharp, careful details. 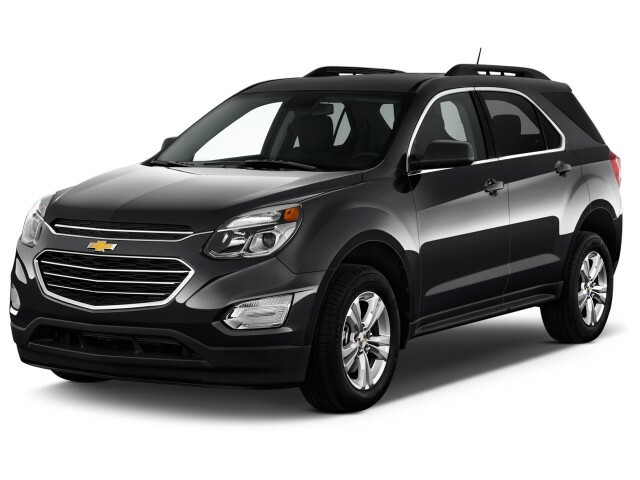 Classed as a compact SUV, the Chevrolet Equinox is slightly larger versus other vehicles in the segment, translating to a great balance between cargo and passenger utility for those seeking a bit more space. The plus sizing also makes the Equinox an ideal family vehicle, enhanced further with a sliding second-row seat. You'll have 31.4 cubic feet of space in the cargo area if you leave the rear seats in their upright and locked positions, but that increases to almost 64 cubic feet if you drop down those second-row seats. Front seats provide an excellent, car-like driving position, while back seats offer enough space for two sprawling adults. Additionally, the seat backs are adjustable for rake, bringing even more comfort to second-row passenger. You also get plenty of cubbies for smaller items, as well as a deep center console and two wells, a retractable cargo cover, and a stretchy net for grocery bags between the two deep cargo wells in back. Chevrolet offers tablet holders that attach to the rear of the front seats. The Chevrolet Equinox was designated as a Top Safety Pick last year by the IIHS. 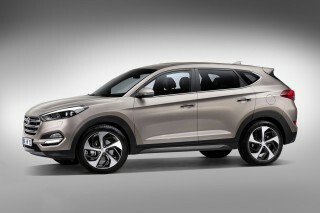 In testing, the agency gave the crossover top "Good" scores in all categories, including its small-overlap crash test. The IIHS only gave the optional crash-mitigation systems in the Equinox a "Basic" score. Federal testers weren't as kind. This year, the Equinox managed a four-star overall rating, including four stars on frontal- and rollover-crash protection. We expect both ratings to carry over into 2017. We are happy to report that Chevy has made standard a rearview camera on all trim levels for 2016, which somewhat alleviates our previous complaints about the poor rearward visibility. The 2016 models also received newly optional active-safety items that bring the Equinox in line with its competitors. We expect many of those features to become more available for 2017. 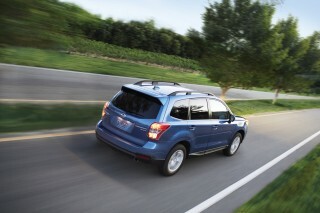 According to the EPA, the base inline-4 manages 22 mpg city, 32 highway, 26 combined when paired with front-wheel drive. Those numbers make the base Equinox one of the better performing non-hybrid crossovers in the segment. Make the move to all-wheel drive (AWD) and those numbers drop to 20/29/23 mpg. Four-cylinder models are equipped with an "Eco" button that dials back accessory power draw such as air-conditioning operation, optimizes shift points for better fuel economy, and locks up the torque converter earlier for efficiency. 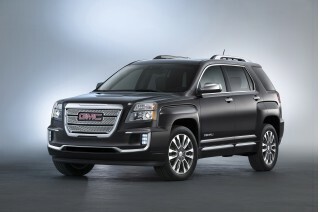 The EPA rates the 3.6-liter V-6 at 17/24/20 mpg for front-wheel-drive versions. We expect far more V-6 buyers will opt for AWD, which is rated at 16/23/18 mpg. The Equinox is still relatively handsome after a makeover last year. To us, the Equinox reads more like a scaled down version of the big Chevrolet Traverse, which isn't a bad thing. The Equinox is a little chunkier, perhaps with a few more styling elements stolen from Chevy's trucks into its more upright flanks. The Equinox is still distinctly more car-like than truck, and fits alongside the brand's sedans with good-looking proportions and sharp, careful details. The Equinox's style is less anonymous and features the dual-port grille bestowed on other GM vehicles. In addition to the new nose, its lower fascia is more sculpted. New reflector-style headlights with LED running lamps were added to LT and LTZ last year, and LTZ models received new fog lamps. V-6 models were additionally bestowed with chrome exhaust outlets, while updated wheels and more exterior brightwork updated the look all around. The taillights borrowed a two-square look like most other Chevy models, and new chrome trim adorns the tail for LTZ editions. Aside from the tweaks, the handsome Equinox continues on with the same basic sheetmetal it's worn since 2010—which we believe has aged quite well, considering. The base inline-4 is respectable, and the V-6 is our pick for towing. The base 182-horsepower, 2.4-liter inline-4 is remarkably advanced for its class, and with direct injection, variable valve timing and a 6-speed automatic, it's fairly thrifty too. Performance isn't bad either; according to GM the base Equinox can run up to 60 mph in around nine seconds. That's in the same ballpark as the Honda CR-V, a car that also does packaging better than performance. Passing requires some preparation—even with passengers on board—but our only real gripe with this engine is that its direct-injection-related clattering is more prominent than in competitors' engines. The 3.6-liter V-6 is the pick for towing, hauling, or performance—if there is such a thing in a compact crossover. It's one of few V-6 options available in the segment; competitors are choosing turbocharged 4-cylinders rather than bigger V-6 engines. The V-6 makes 301 hp and 272 pound-feet, and it's considerably thirstier than the inline-4. 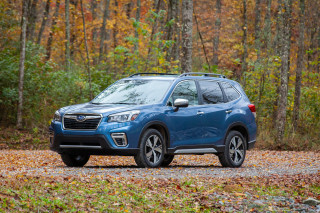 It's rated to tow up to 3,500 pounds (compared to 1,500 pounds for the inline-4) and should give most families what they're looking for from the segment. Both engines can be paired to all-wheel drive, and that drivetrain adds roughly 100 pounds to the overall mass. With a rather low first gear, for quick takeoffs, plus taller cogs for the upper gears and highway fuel efficiency, the 6-speed automatic covers the bases—although it's not as smooth as in other vehicles in this class. With either engine, shifts can be rough, and the transmission can feel hesitant on hills or on-off throttle situations. Manual shifts aren't made though steering wheel paddle shifters or a separate gate, rather through little plus or minus toggle buttons that for 2016 were moved to the top of the shift knob. A sliding second-row seat helps maximize interior space for passengers or cargo in the Equinox. The 2017 Chevrolet Equinox is fairly large for a compact crossover, and it is versatile for families that don't need three rows of seats. 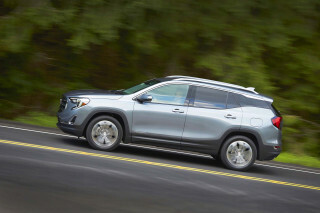 It's more maneuverable than the much larger, three-row Chevy Traverse and less macho than the mechanically related GMC Terrain. The front passengers—especially the driver—have the best seats in the house. The seats are upright and supportive, regardless of trim, while the cross-stitched, dual-tone perforated leather on pricey LTZ models have an upmarket luxury look and feel. In back, there is adult-sized space for two with good head room and decent leg room. The seat back is adjustable for rake and can slide fore and aft 8 inches to maximize space for carrying people or cargo. It's handy for children who don't necessarily need much leg room, but do require a small mountain of gear per child for long-distance road trips. We've found in previous generations that the interior materials are good quality and not typical parts-bin affairs. The light refresh last year took care of many cheaper-feeling materials, and upgraded the base cloth seating in L and LS models. We were pleasantly surprised by the composure of the cabin in the Equinox—it's closer to what you'd picture a Buick or Cadillac to be. There's a clever noise-cancellation system that quells sounds, thrums, and mild vibrations in inline-4 models after you're underway; there are some coarse rhythms at idle, however. Wind noise is well shut out, with triple door seals and glass with integral sound damping. Ride quality is good too, and there's plenty of stow space for larger and smaller items, which altogether makes the Equinox a good family vehicle for highway trips and vacations. A retractable cargo cover, stretchy net, and two deep cargo wells all help keep items in place and out of sight, and there's a deep center console for electronics and purses. The only downside, we think, is that the cargo floor is just a little too high—or at least higher than we might expect. The 2017 Chevrolet Equinox is nearly identical to the 2016 version, which allows us to draw reasonable conclusions about its safety. The good news: The Chevrolet Equinox was designated as a Top Safety Pick last year by the IIHS. 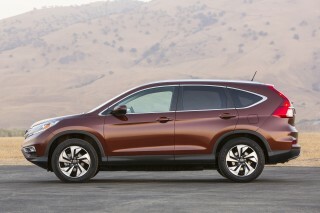 In testing, the agency gave the crossover top "Good" scores in all categories, including its small-overlap crash test. 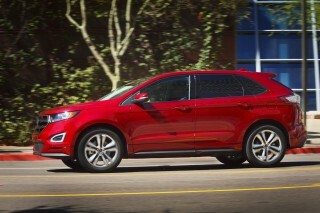 The IIHS only gave the optional crash-mitigation systems in the Equinox a "Basic" score. The bad news: Federal testers weren't as kind. This year, the Equinox managed a four-star overall rating, including four stars on frontal- and rollover-crash protection. We are happy to report Chevy added a rearview camera to the standard-equipment list on all trim levels last year, somewhat alleviating our previous complaints about poor rearward visibility. The 2016 models also get newly optional active-safety items that bring the Equinox in line with its competitors. The Equinox makes standard many safety systems that could be life-saving in a crash. Four-wheel disc brakes, electronic stability control, head-curtain and pelvic airbags are all standard in the crossover, as are OnStar emergency systems. While many of those systems are nearly universal in all new cars, it's worth understanding how those systems are used—especially in a vehicle aimed toward families such as the Equinox. Lane-departure warning and forward-collision warning systems are available more widely on inline-4 and V-6 models, and standard in the LTZ. The 2016 model added available blind-spot monitors and rear cross-traffic alert systems for LT and LTZ trims. We've found that outward vision is still a challenge in the Equinox. Its thick rear pillars were constantly in our way. We still recommend paying close attention to field of view on a test drive. 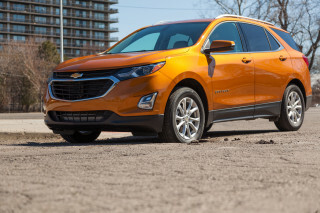 Chevrolet has kept the Equinox in the mix thanks to good tech and impressive options. Chevrolet isn't expected to dramatically change the 2017 Equinox from last year. We're still expecting a long features list, with good available technology and convenience features—even a few advanced active safety options too. For that reason, and that Chevrolet has made standard more equipment, the Equinox is still a good value at just over $22,500 to start. Last year the available models were streamlined to just L, LS, LT, and LTZ trims. All models come with a 7.0-inch touchscreen for infotainment with Bluetooth phone pairing—LT and LTZ models receive the MyLink system that enables Bluetooth streaming. MyLink also integrates Pandora and Stitcher internet-radio streaming, plus hands-free controls and navigation connectivity. Base L models come with basic creature comforts, but are front-drive only. All-wheel drive is a $1,750 option on LS trims or higher. A rear-seat entertainment system, navigation, leather, heated seats, steering-wheel controls, a sunroof, 17-inch wheels and remote start are all options on the LS. Mid-trim LT models are set apart by 17-inch alloy wheels, anti-theft, keyless ignition, a leather-trimmed steering wheel with mounted audio controls, and new buyers are given an extended one-year trial to GM's OnStar service versus the normal six-month affair. But if you want all the bells and whistles, opting for the LTZ trim brings a laundry list of options to the Equinox, including leather seats, memory seat settings, automatic climate control, universal remote, and both forward collision warning and lane departure warning. But you'll have to tick a few extra boxes for blind-spot monitors and rear cross-traffic alert systems as they're still optional extras on both LT and LTZ models. Chevrolet's in-car wi-fi hotspot is standard across the range and includes a trial for 3 months or 3 GB. Additional data is available via subscription. The 2017 Chevrolet Equinox posts impressive figures with its inline-4, but real-world mileage is another story. Those 4-cylinder models are equipped with an "Eco" button that dials back accessory power draw such as air-conditioning operation, optimizes shift points for better fuel economy, and locks up the torque converter earlier for efficiency. Unlike many of its competitors, the Equinox offers a V-6 option that's predictably thirsty, but has the power to tow and pass on steep mountain grades. The EPA rates the 3.6-liter V-6 at 17/24/20 mpg for front-wheel-drive versions. We expect far more V-6 buyers will opt for AWD, which is rated at 16/23/18 mpg. We recommend the inline-4 if your Equinox is a commuter car for several reasons, but it comes with a caveat: A light foot and advanced planning is required to achieve those figures. Matching estimates with real-world economy (especially at altitude) can be elusive. An excellent purchase. I'm done. Can't get blood from a turnip. It is good sub but pricey. Hope it was made more fuel efficient.